Congratulations once again to Nick Horn! We have a trifecta! Nick Horn has once again hunted his way to the title of THOY. 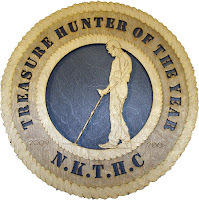 2016 proved to be another good year for Nick and was once again rewarded for his efforts by winning the Treasure Hunter of the Year award for his third straight year. Nick has definitely been bitten by the treasure bug and spends much of his free time with his Dad detecting and digging old bottles. Nick is one of the youngest members of our club and is a solid hunter who no doubt will continue to be a contender in the Find of the Month competition in the upcoming years! Congratulations to everyone for a great 2016. Thanks to everyone who participated in the Find Of The Month competition throughout the year, and we look forward to seeing all of the interesting finds that you and the other members can come up with in 2017 to make the competition as exciting as it has been for this year. For his efforts, Nick will receive a framed certificate, custom wall plaque, and a free dinner at this years club Christmas dinner.